Combine the milk, cream, rice, sugar, cinnamon, vanilla, nutmeg and orange rind in a saucepan and cook over medium heat, stirring occasionally until it reaches a simmer. This could take about 5 minutes. Remove mixture from the heat and set aside for about 15 minutes to infuse. Remove the cinnamon stick and add the egg yolks, stirring to combine. Pour the rice mixture into a casserole dish with a 4 Cup/1 Litre capacity. 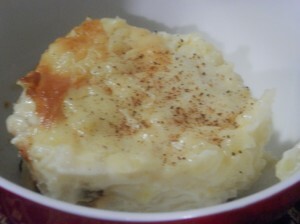 Bake for 40 minutes or until the rice is tender and the custard has set. Remove from the oven and set aside for 10 minutes before serving with ice-cream. Notes: Why not try adding some Dried Apricots? Just soak them in some boiling water to soften, and then dice them into bite-sized pieces and toss them in.